Especially at Pappardelle’s Pasta stand inside the great Pike Market of Seattle; where one may sample a dip from assorted balsamic vinegars, or buy at $10-$18 a bottle. Flavors include Blackberry Ginger, Chocolate, Modena Barrel-Aged, Pear Lime & Cinnamon White, Raspberry and Vanilla Fig. Also, Pappardelle’s offers a fine selection of uncommon pasta noodles. Try the chocolate flavored! 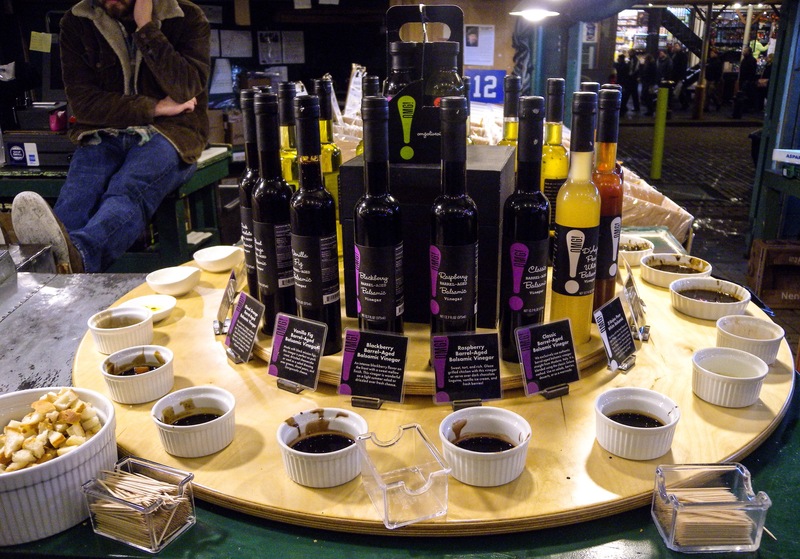 Posted on January 6, 2014 by Orion T.	This entry was posted in Food, Travel and tagged balsamic vinegar, Pike Market, Seattle, taste, tasting, travel, variety, vinegar. Bookmark the permalink.